Speak again, Cordelia: What is a cupcake without frosting? 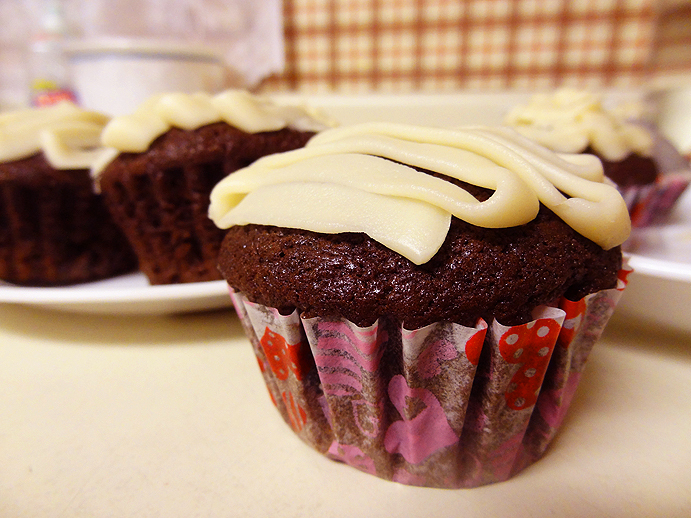 What is a cupcake without frosting? Lately these days, I've been thinking about how blessed I am to be able to speak English, and how I take it for granted. Not in the sense of "English is the best language in the world because I speak it! ", but how much more convenient the skill of being able to use it makes my life, and also how much more careless I become because of it. Of course, a lot of research and information is conducted and recorded in English these days, and certainly it would almost be essential to the life of an academic. But I'm also talking about how the regular non-English speaker comes across English on a daily basis and has to expend a lot more effort to function around it, despite English not being one of their own languages. This came across my mind again the other night when I was putting a carton of 1% buttermilk into the fridge that I had bought to make cupcakes, and I was thinking how I'd have to tell my grandma that it was buttermilk and not the usual 1% milk that they drink. Sometimes I look up information on websites or read receipts for my grandma, and I've taught her how to ride the skytrain and how to recognize which one to take as well. Of course, there are multiple ways to learn a routine, like looking at the first capital letter of the destination written on the incoming train and remembering the difference between how an "R" and a "Y" looks (which is how I taught it to my grandma). But in the end, it's inconvenient and ultimately requires someone else to teach it once to you first for every task. This is in a case where you don't speak English and live in a country where English is predominantly being used. I'm still often told by friends and family how envious they are of me and my ability to speak English. When I was in Hong Kong, my uncle--whose undefeatable hobby is cars--browsed online forums a lot and would often ask me questions on what certain terms meant, or would ask me to interpret what other users posted in English (although sometimes I really had no idea, especially if they were words concerning car specs and such). Recently, when I mentioned how I've been learning programming lately, another friend also told me how much easier it is to learn coding if you already speak English. That is, it doesn't automatically make programming an easy skill to learn, but it would definitely make learning code a lot more manageable--and I agree. It's like learning French if Spanish was your native language rather than, say, Tibetan. Business-wise, obviously, English is being used to conduct international trade for the most part. I recently participated in the Boston Career Forum for Japanese-English bilinguals, and in that sort of environment, I almost felt that it was treated as a "privilege" to be able to speak English. One of the requirements to participate in the forum was that one must have studied abroad as an exchange student at a foreign university or graduated from one (thus [supposedly] leading to one's English competency). Especially for Japanese nationals who grew up in Japan, I think, that would imply having the means of doing so in the first place. Aside from requiring a decent amount of money, study abroad opportunities are mostly available only at major universities. So it seems to me that, in general, it's not simply the willpower or determination to study English that is being required, but also the financial means and educational background, amongst other personal factors to obtain such an opportunity and then participate in a forum restricted to these kinds of individuals. In a way, this seems very elitist to me. It creates this terribly competitive atmosphere and pressure involved with being able to speak English, and honestly, I really dislike it. I'm getting a little off track; back to talking about English in the daily life. The other day, I was reading something at home and my grandma had made a passing comment (in Chinese) like, "It's so nice, being able to read English." I had replied, "Is it nice? You can read Chinese, that must be nice too." And she had said, "No, being able to use English is so much better." I won't disagree with how convenient it is to know English, but I think it would be just as well if she could take an equal amount of pride in the language she can speak herself too. I heard from my grandma's brother that she never formally learned to read and write Chinese in school, and that makes me all the more amazed at the fact that she regularly reads newspaper and watches foreign shows with subtitles now. I feel it's as if she worked much harder for the skills that she possesses now, in comparison to me who learned to read and write inductively at school while growing up, with no particular effort or determination on my part to do so. All in all, I often get comments on how "smart" I am for being able to speak English, but to the point that I've started to feel a little guilty about it. Because, really, I've done nothing to deserve such a comment. I started using English when I was 4 years old because my teachers and friends spoke it to me at school, and every time I turned on the TV or radio, or opened a book, it would be in English. If anything, the praise should go to my mother for having invested her daughter in an education in an English-speaking country. The looks of awe that I find myself receiving when I speak English in an environment where English is not a dominant language, I never know what to make of it. Because I'm not exerting any special skill when I'm speaking in English--I'm simply speaking. As can most people in this world, in their respective (and equally beautiful) languages. That's why I've decided that in order to feel less undeserving of my ability to use English, I'm going to have to develop a real skill to complement it. Like programming. Or being able to speak another language equally as well, so I can proceed onto learning the art of translation. Or at least utilizing English in a way that will produce some kind of result, like finishing my novella. There must be many more ways I can develop my set of skills, but in the meantime, I've decided to focus on these three for now. Instead of theorizing on what could be done, I want to aim for something concrete so when someone compliments me on my English skill, I can say, "English is a great language, because I was also able to use it to learn ______ and to do _______." I want to be a useful human being!